JUNE 2018 RETAILOBSERVER.COM 17 individualized applications on a powerful appliance. Behind closed doors, the Burlesque refrigerator touts a deep burgundy interior to marry classic luxury with modern allure, bringing an unexpected romance for discerning tastes. 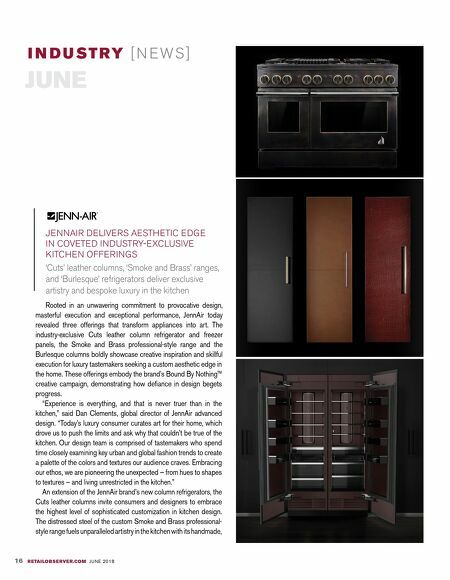 CUTS LEATHER COLUMNS Each Cuts leather column is swathed in seductive leather cuts, carefully sourced from high-end Italian tanneries that work with haute fashion houses, to offer a fashion-forward, beautifully-crafted and unmistakable kitchen refrigerator. Born from a desire to deliver softness and craftsmanship typically reserved for custom furniture, the introduction of the leather columns within the JennAir portfolio signifies a shift from traditional design. Of the 400 sets currently available, consumers can create a custom look, pairing hand-selected refrigerator hardware with columns to meet a range of tastes and styles and deliver a new aesthetic appeal in the kitchen. Furthering the bespoke experience, the columns can be installed with a dual-leather look, offering separate columns for refrigerator and freezers for even greater authentic, trend-forward design. Reserved for the discerning indulger who seeks envy-inducing luxury products, the leather columns will be available in designs in plush, saturated hues including Croc, Cognac, Carbon, and Caviar. The new leather columns will be available in late 2018 SMOKE AND BRASS PROFESSIONAL-STYLE RANGE Showcasing the heart of the brand's rebellious soul, the Smoke and Brass 48-inch professional-style range delivers a hand-applied finish of layers that create depth on a traditionally bright, polished surface. The range strikes an artful balance of light and dark, with two-tone accent colors applied to blasted surfaces complementing the distressed, dark range. Finished with a machined handle, Smoke and Brass demonstrates newfound artistry within an appliance typically bound by tradition. The end product beautifully marries art and craft with high precision. Inspired by the desire to make a unique, ownable statement in the kitchen, no two Smoke and Brass professional-style ranges will be the same, offering luxury tastemakers a kitchen asset to truly call their own. With only 50 planned for consumer availability, each range will be stamped to signify its hand-crafted origin. Available in late 2018. BURLESQUE REFRIGERATORS The Burlesque refrigerator boasts an interior as provocative as the industry can imagine and only 13 are planned for creation globally, with three already reserved. Moving beyond the current suite of JennAir products, this offering delivers a true luxury experience. More than meets the eye, Burlesque is marked by its rich and sensual burgundy-hued interior inspired by the deep reds often seen in luxury cars and the lush, velvet interior of an antique jewelry box. JennAir delivers modern edge to classic luxury with this option, which can be paired in a number of ways, including with JennAir stainless steel panels or with Cuts, to stimulate your senses for a truly individual kitchen design. During a moment in culture when food is held in incredibly high regard, the Burlesque refrigerators intoxicate the senses, giving select tastemakers an opportunity to enhance their kitchen appeal and bring the care they would opt for in storing the finest jewels to their entertaining space. Intentionally unexpected, the warm burgundy hue at first feels alien in contrast to the traditional cold interior. This tension creates a product that is both beautiful and shocking, igniting lust and delight for select owners. Each of the 13 Burlesque pieces, with a Manufacturer's Suggested Retail Price of $30,000, will be hand-stamped with a unique identifier, an unapologetic expression of the pinnacle of luxury. The refrigerators– a result of a meticulous eye to detail and elevated performance– combine artistry with technology. Visit JennAir.com to learn more. 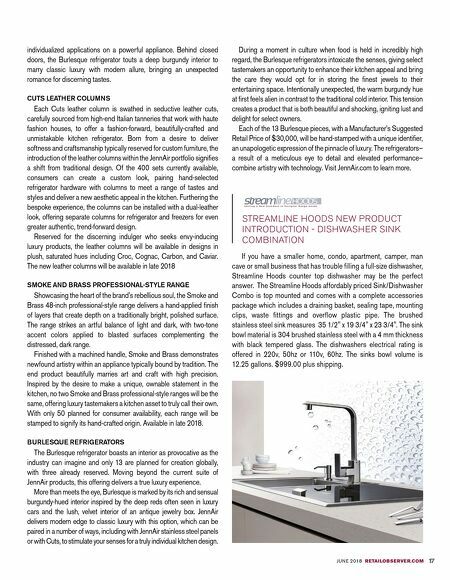 STREAMLINE HOODS NEW PRODUCT INTRODUCTION - DISHWASHER SINK COMBINATION If you have a smaller home, condo, apartment, camper, man cave or small business that has trouble filling a full-size dishwasher, Streamline Hoods counter top dishwasher may be the perfect answer. The Streamline Hoods affordably priced Sink/Dishwasher Combo is top mounted and comes with a complete accessories package which includes a draining basket, sealing tape, mounting clips, waste fittings and overflow plastic pipe. The brushed stainless steel sink measures 35 1/2" x 19 3/4" x 23 3/4". The sink bowl material is 304 brushed stainless steel with a 4 mm thickness with black tempered glass. The dishwashers electrical rating is offered in 220v, 50hz or 110v, 60hz. The sinks bowl volume is 12.25 gallons. $999.00 plus shipping.